Back in June, Reid Sheehan Latimer + Crew made this "Yoga" spot for Yelp, positioning the review network as the place people go to find businesses that meet their needs (instead of where assholes and aspiring Internet comedians go to whine about bad service). 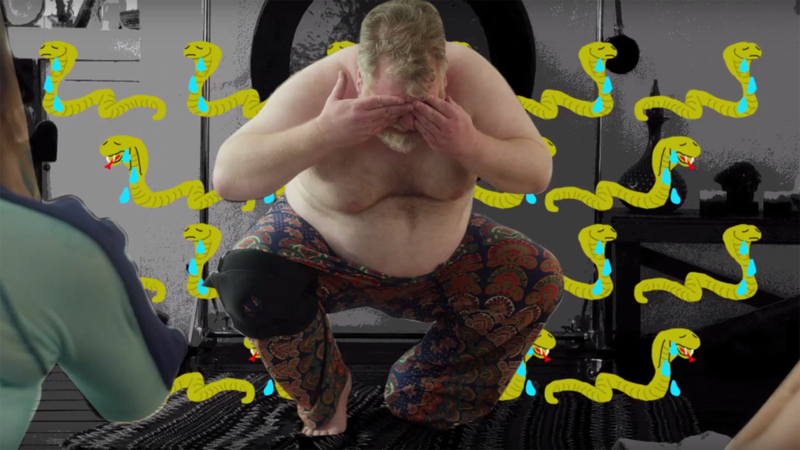 The spot's yoga instructor merited his own Twitter feed, and now the spot's back with a remix, giving you even more of the rotund teacher who has mastered The Weeping Cobra and generally making everyone around him uncomfortable. The resulting clip includes footage not seen in the original spot, along with a house drum loop, cartoony overlaid animation, and a splash of Auto-Tune on the bad yoga instructor's vocals. The visuals get really weird around 54 seconds in, which we enjoyed. Frankly, it would have helped if it'd gotten there sooner. Remixing an ad is a neat idea, though it could be argued this one doesn't go far enough. If they'd structured it like a legit club track, instead of mashing content together and putting a beat under it, this would have better staying power and joined the storied ranks of Hamburger Helper's surprisingly excellent rap album, Watch the Stove. Still, Yelp's "downward facing failure" line is gold, though.